As I noted in my previous entry, my 1887 edition of Jerry Thomas’s Bartenders Guide lists the original “Whiskey Cocktail”—that’s the one we now think of as the “Old-Fashioned.” That same publication provides evidence that the hard-line definition of the “cocktail” was fraying at the edges. Thomas’s Guide for the first time includes recipes that call for ingredients unavailable before the middle of the 19th century. Entropy and imagination were loosening the tight boundaries of the cocktail category, which was evolving into something much more difficult to define. Beginning with curaçao, a growing list of liqueurs and other new ingredients were creeping into the mix as the cocktail became increasingly baroque. Maraschino appeared, and absinthe, and most important of all, vermouth. Thomas records that the industry was using these ingredients to “improve” the old cocktail formulas, and in new combinations that would become the cocktails we’re familiar with today. That original, “unimproved” Whiskey Cocktail is an excellent and straightforward drink; I like its simplicity, its lack of pretention, and its solid winter-by-the-fire character. Which is not to say that there’s anything wrong with the derivatives; the successful ones trump the original in terms of imagination, flavor, diversity, and sophistication. And of course, plain old entrepreneurial spirit. Take 2 dashes of Boker’s (or Angostura) bitters. 1 small piece of the yellow rind of a lemon, twisted to express the oil. 1 small wine-glass of [Bourbon or rye whiskey]. Fill glass one-third full of shaved ice, shake well, and strain into a fancy cocktail glass, put the lemon peel in the glass and serve. The flavor is improved by moistening the edge of the cocktail glass with a piece of lemon. Fill glass one-third full of shaved ice, shake well, and strain into a fancy cocktail glass, put the lemon peel in the glass and serve. The flavor is improved by moistening the edge of the cocktail glass with a piece of lemon. Two things in particular caught my eye in this recipe, the technique and the glass. An even bigger surprise was the “cocktail glass.” I’m so used to the idea of serving this type of drink in a rocks glass—it is called an Old-Fashioned glass, after all—that I didn’t even see the cocktail glass notation the first couple times I made this drink. Thomas probably didn’t have V stems available; his cocktail glass would have been a rounded affair, more like a small wine glass. It pleases me to substitute a coupe. Or just stick with the rocks glass, Sazerac-style. “Building on the Old-Fashioned—The Improved Whiskey Cocktail” at cold-glass.com : All text and photos copyright © 2011 Douglas M. Ford. All rights reserved. I just love cocktails! Yes, you got me. I desire them! Thanks for sharing. My husband adores old-fashioneds, so much so that he orders them wherever we go out, as if to test the bartender’s skills and imagination. To no surprise, he is frequently disappointed with the result. This post was particularly interesting for me to read (I forwarded it to my husband, as well), because he knows the old-fashioned as follows: muddled cherry and orange, simple syrup, soda water, bourbon, on the rocks, stirred, with a cherry orange garnish. Quite different indeed! Thanks for posting. The “fruit and soda” question is certainly part of the Old-Fashioned environment. As you can tell from my posts, I’m on the “leave it out” side of the divide; there are well-respected bartenders—I’m thinking particularly of Dale DeGroff (The Craft of the Cocktail, 2002)—who come down on the “muddle” side with your husband. DeGroff’s reasoning is that the fruit-free version is little more than sweetened whiskey, and that the fruit adds interest and flavor. In my opinion, the bitters make all the difference in the fruit-free original; I find the muddle unattractive, and the fruit sugars push the sweetness way to the boundaries of my tolerance. I’m not sure there’s a middle ground there, that it really comes down to an individual’s sense of sweet and bitter. And underlying it all are the characteristics of your chosen whiskey base. It’s a very complex problem. So even though it sounds like your husband and I come down on opposite sides of the Old-Fashioned divide, I’m delighted that he has thought about it enough to know what he wants, and, like me, finds amusing sport in offering a “standardized test” to each new tavern. Hi, Steve, so Polish Whiskey Sour, eh? I’ve not heard of it, either. I always figure that if Google doesn’t know about it, then you’re on to something fairly interesting. I’d love to find out more about this—sours are way up my list of good things—let me know what you learn from your Dad. So there you go… not something a bartender is going to know how to make, but maybe you can try it out at your bar at home! I plan on giving it a try. Maybe we can turn it into a famous cocktail!! I don’t know if I have the courage for this one—equal parts concentrate, whiskey, and beer, that’s a daunting flavor combination. Perhaps I’ll give it a try on some hot, sweltering summer afternoon. Perhaps. This is a great story, very amusing, and I love the details. Thanks for following up. What a cool blog. I want an improved old-fashioned right now, but I’m fresh out of ingredients. Doubt the local bar could match your style! Cheers! I like the adaptation. What’s your cold glass of choice for superbowl sunday? I’m thinkin’ bloody mary, extra bold and spicy. Okay, I lived in Chicago for 8 years and have a pretty good sense of Wisconsin. If you want authentic Wisconsin, it’s got to be beer. Wisconsin is known for cheddar, not blue cheese! You’re obviously joking when suggesting a martini as the alcoholic representation of Wisconsin during a football game! Not that you can’t get away with it — you should drink what you want, but if you’re planning to be authentic, drop the martini or the Bloody Mary idea and go for beer. I like St. Pauli Girl myself. All my blue cheese comes from Wisconsin. Except the half that comes from Minnesota. And, oh yeah, I guess there is an occasional French that slides in there. As for authentic beer, well, I don’t love the Packers that much. No, martinis it will be, with a bit of blue. But that reminds me, today I encountered Cheesehead Wine for the first time. I have no idea what it is, but I love that tiny cheese hat that fits over the bottle neck. Really the best blue cheeses are French, imo. I’ve tried other countries, but keep going back to the French blue cheeses. I usually buy the high end stuff at Whole Foods. If I’m cooking with it, I just buy the cheap stuff at the grocery store, have no idea where it comes from. I’d think in a martini, since the bleu cheese is adding such a big flavor hit, you’d want the high end stuff! ha … gotta love that miniature cheesehead hat on the bottles of Cheesehead Wine. It’s a very sweet white table wine … and the color .. dare I say it…. cheesey yellow?! Thanks Doug! Aweosme; thanks for sharing this! Cocktails is what i like, i do sometimes try out to make a few at home but this blog is really great to give inspiration, nice post and thanks for the share. What a great idea for blog. Love the commentary on the recipes too. Going to keep an eye on it for a while. wow you seem to know your drinks. I love the blog! now I want a drink, the one that was expressed in the blog to be exact, but I don’t have any of those ingredients in my cabinet. The old fashioned is one of my favorite drinks and it sure seems like you know how to make a good one. I love your glassware, too. What is gum syrup? I have made simple syrup many times, but don’t know what gum syrup is. 1/2 tsp. Maraschino is just the syrup? What do you do with the cherries?! I’d make this, but since I am not sure about the above, need some clarity first. Some of us are just neophytes in the land of cocktails and need a little guidance! As for the Maraschino, that’s really Maraschino Liqueur; it’s quite a different thing from the juice in your maraschino cherries. 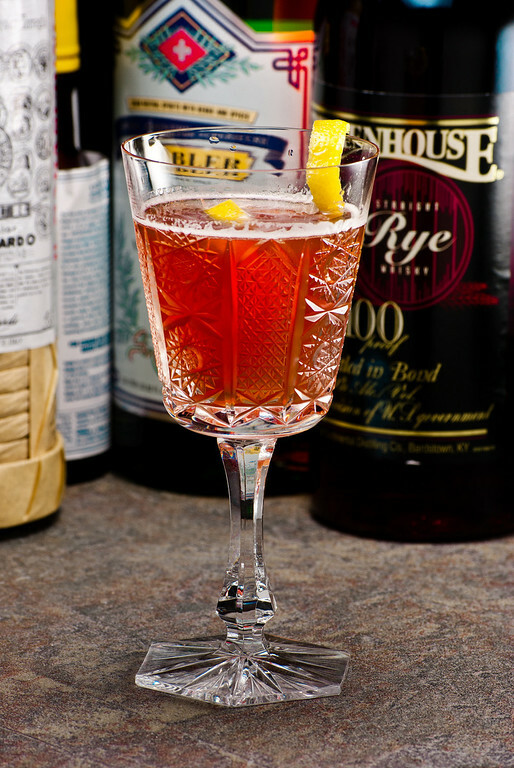 It’s used in many classic cocktails; if you decide to stock it in your home bar, expect to take a while to get through a bottle, as you normally use it only a bit at a time, as exemplified here by the Improved Whiskey Cocktail. Don’t be tempted to get cheap stuff; Luxardo is a fine product, and widely available. Thanks. I sure would have used Maraschino cherry juice if you had not steered me in the right direction! I’m not a huge drinker, have had bottles of booze around for years. I currently have an unopened bottle of Macallan 12 Single Malt Whiskey — will that work for the whiskey part of this drink? I also have some Jim Beam bourbon whiskey left — is that better? Or could the both be used? My favorite thing about the “original” recipe for the Old-Fashioned is that you could make the drink with any spirit you pleased—it didn’t have to be whiskey, it could be gin, brandy, even wine. And Jerry Thomas’s “Improved Whiskey Cocktail” is modeled directly on his recipe for the “Improved Brandy Cocktail,” so I’d say the field is wide open for using just about any whiskey that pleases you. Historically, the commonly available whiskies would have been rye and bourbon; the Canadians would have had, well, Canadian. There is absolutely no reason that Scotch wouldn’t work in this drink—all that matters is that you like the flavor. So you are exactly right with your instinct that both could be used; you have two distinctly different whiskies there, and a great opportunity to try them both and see if you prefer one over the other. I may try both, see how they taste. Also, I saw another post that talked about muddled fruit (and your reply), and as my palate favors sweeter drinks, I may try that as well. Thanks for your replies and advice. You sure seem to know your booze! Yum! Any articles on interesting Vodka recipes using Absolut vodkas?? That’s the MUSE! still my favorite drink – still surprised how few bartenders don’t know how to make this; in fact, they usually ask me. I once asked for a whiskey stone sour and had to tell the bartender how to make it. I know that is not like asking for a “slow comfortable screw up against the wall” but, really, you do not know a three-ingredient drink? Great post and congrats on being featured. Very cool post btw, now that I’m finished being insane. I am perpetually intrigued by the trendy “mixologists”, which have sprung up in such great numbers across NYC as of late, and in turn have become fascinated by the notion of where everything originally got it’s wings. That would be very cool, though if everybody teleported their straws at once, I’d have no drink left. Doug, excellent blog and post. The Old Fashioned has become one of my favorites recently. I’m traditionally a vodka & tonic guy (with a lime), but have been on an old-school kick lately. I appreciate the simplicity of cocktails from days gone by and am sometimes put off by the trend of unconventional drinks poured into a V-stem and automatically annointing it an “X” martini. I think the key with the Old Fashioned, or Improved Whiskey Cocktail, is some good bitters and keeping it simple. Make mine on the rocks with a nice and weighty low-ball glass. Perfect. Yeah, there’s something good about a simple drink in a heavy rocks glass. One big piece of ice. Life is good. great idea for a whiskey cocktail. i’ve only done on the rocks or straight really, so this sounds like a great introduction to some whiskey variations! These barflies will have to have their favorite bartender make them one…or two…I can imagine the poem now…Ode to the Wiskey Cocktail….or something like that. Darn, I am fresh out of Absinthe. Stop by my photo blog! Thanks. And I think there are a lot of people who will agree with you about the Sidecar, what a gorgeous drink that is. now this is one article that you need to read it first thing on monday :), especially after a party weekend. For my wife and me, an old fashion marks the beginning of the holiday season. We have always made the “muddled fruit” version: a really good bourbon, sweet Florida Parson Brown oranges and maraschino cherries. However, the recipes in your blog or intriguing and certainly will complement a good bourbon. Thanks for a well written piece. Spending the week before New Year’s Day making a different variant of the Old Fashioned, as a quiet homage to that which has gone before. So far I’ve done a few Old Fashioneds with various different whiskies (Eagle Rare 10 Year Select Barrel, Rittenhouse Rye 100, Old Weller 107, Buffalo Trace), and a few different brandies (St. Remy VSOP, Hine Rare VSOP, Courvoisier VSOP, Ferrand Ambre), and then a few more outrageous variants, like Brian Miller’s Conference Cocktail and Phil Ward’s agave-based rebuttal La Conferencia (obviously I have had friends over to share in this cocktailery, I’m not that hopeless an alcoholic). I was glancing through my various cocktail books for a new version today, and decided to have a look at your Old Fashioned section here, and I’m glad I did. Jerry Thomas really was the man, and this drink is intense and delicious. I did make some minor adjustments: I love anise, and so does my girlfriend, so we equalized the absinthe and maraschino at 1/6 tsp each (and it still threatened to be too sweet as it warmed), I went with the spicier Rittenhouse 100, and we substituted one of the dashes of Ango for Peychaud’s, reasoning that Peychaud’s loves rye and absinthe. It was delicious. Thank you for the inclusion on your website here; it is very likely I would not have found it otherwise. Jacob, I’m delighted that you found this post, and a recipe that works well for your modifications. There’s something about the Old-Fashioned that lends it perfectly to modification and experimentation. I particularly like the idea of adding a dash of Peychaud’s; it sounds delicious, and I’m looking forward to trying it out, perhaps tonight. Thanks!